Who Was the Artist Hubert R. Lewis? Looking at the old photos I have of my great grandparents, I can see only dark eyes, in shades of black, white, grey and sepia. I see the somberness of a young man in the late 1800’s, and the slight smiles that sometimes shown through as the same man aged. It is said that people rarely smiled back then due to the time it took for a photograph to be captured, and due to lack of dental care. Seeing into the souls of the dark, blurry eyes and straight closed mouths is given some depth by the other slightly nuanced looks. Their clothing in the photos further explains some of their lives’ and the goings-on of the times. A well-dressed young man, in a three-piece suit with a bow-tie, and a kerchief in his front left pocket, shows he is ready to emigrate and face America. I wonder what his dreams were as he was sailing with his father, and younger brother. Did he dream of working in the steel mills, the very work that gave him a job and a chance in the United States? Or was he already making plans to become an artist? Who was this artist? Who was this man? On a visit to the town of Govan, Scotland, young Thomas Lewis and his wife Adelaid welcomed their first son into the world on April 5, 1865. Hubert Robert Lewis was the eldest of seven children. Hubert was just a boy of 17 when he arrived in McKeesport, Pennsylvania in 1882 to work in the steel mills from Wales. Hubert met Sarah Benjamin, who was born in Stockton-on-Tees, England and arrived in the United States as a baby in 1867. Three years after his arrival to the United States, Hubert and Sarah eloped on February 18, 1885. Together they bore five children. Sarah was supportive of Hubert’s work as an artist. He was working in the rolling mills in Apollo when he received his first commission. It was a portrait of an Apollo tailor, who paid him with two custom-made suits. Hubert was a self-taught artist, starting his career in 1891 at 26 years of age. In 1893 he received honorable mention at the World’s Columbian Exhibition at Chicago for one of his works. I have a copy of the letter he lovingly wrote to Sadie while at World’s Fair. Hubert sat daily in front of his easel creating pastels and paintings of landscapes, people, and florals, as well as replicating famous art pieces; however, he gave few public exhibits. His works are signed either H. Lewis, or less commonly H.R. Lewis. Some of his works also bear the year of the painting. Sadly, all do not. 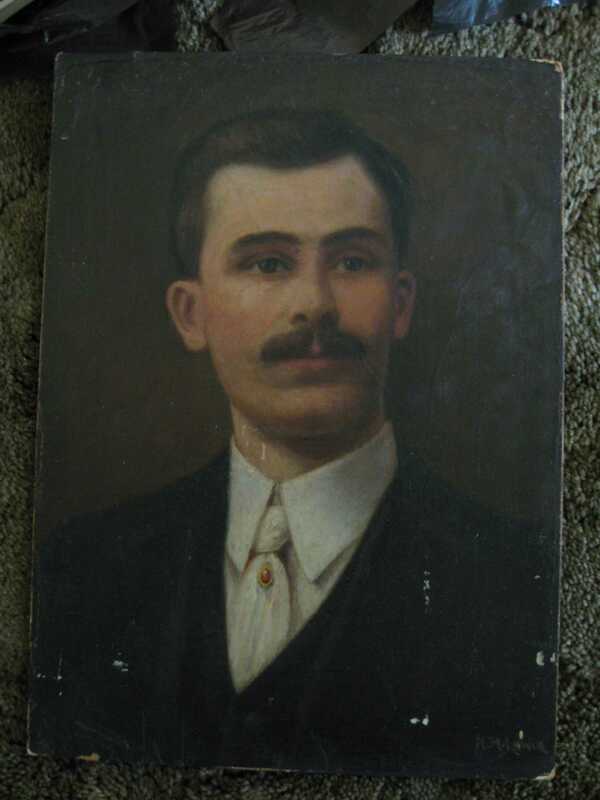 Unfortunately, some of his paintings or pastels were listed on some auction or antiques site forums as being a Henry Lewis, or a few people inquired, perhaps it was a Hugo Lewis. I answered on forums informing people who Hubert Lewis was and leaving my email if they wanted to contact me about him. I have also checked signatures to help determine if the signature on the work matches the signature I have of Hubert Lewis’s. Then I found out about the confusion of H. Lewis being a pseudonym for R. Atkinson Fox prints. I happened onto a popular auction site and saw for myself an H. Lewis print listed as R.A.Fox print signed H.Lewis ( pseudonym ). The R Atkinson Fox Society spokesperson explained that around 10-15 years ago there was confusion, as R Atkinson Fox had many pseudonyms, and the style of both artists were alike in some ways. However, that confusion was cleared up when it was discovered that Hubert was, in fact, a real artist. This entry was posted in History and tagged 19th century art, 19th century artist, Apollo, art, artist, Govan, H Lewis, H.R. Lewis, HR Lewis, Hubert, Hubert Lewis, Pennsylvania, Stockton-on-Tees, United States. Bookmark the permalink. 2 Responses to Who Was the Artist Hubert R. Lewis? Hey There. I found your blog using msn. This iss a very well written article.